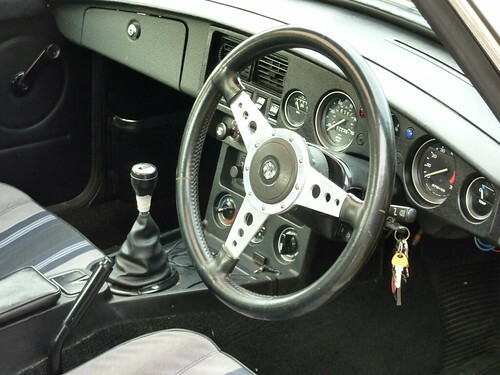 There are a few options for steering wheels out there - MOMO, Tourist Trophy and Mountenoy are a few, spanning a range of styles, materials and prices. Having had a good look through I'd settled on a Moto-Lita 14-inch 'Mark 4' wheel. These are really nice wheels with a chunky hand-stitched leather rim and polished chrome drilled spokes which I thought would suit the late-model B very well. These wheels are really good quality, but are also pretty expensive, so I was very pleased when while chatting about wheel choices on the MGOC forums, I was offered exactly the wheel I was after at a fraction of the price. It turned out one of the other members was doing the exact reverse of me, replacing a Moto-Lita with an OEM wheel. A few emails and exchage of funds later and I received the wheel in the post, so thanks Brian! The original steering wheel is 15 inches across, which enables the pre-power steering B to be easily manoeuvred. However a wheel that size can be tough to use on winding roads and restricts the legroom for the driver. The thin grip can also make long drives a little uncomfortable, so its replacement would hopefully solve all of these, as well as looking a bit more attractive. The Moto-Lita boss seemed much deeper than the OEM one, but once on it fits very well and after a short drive to confirm alignment the wheel is much more pleasant to use than the OEM one. I was a little concerned that it might obscure the oil and temperature gauges, being slightly smaller and thicker, but while it cuts your view a touch it is still easy to read them. I was also expecting an increase in effort required to turn the wheel, but again the difference is not discernible.